Bill Gates is out with his annual summer reading list and, while longer than last year’s, it’s a great place to kick off your summer reading. On Immunity, by Eula Biss. How to Lie With Statistics, by Darrell Huff. Should We Eat Meat?, by Vaclav Smil. 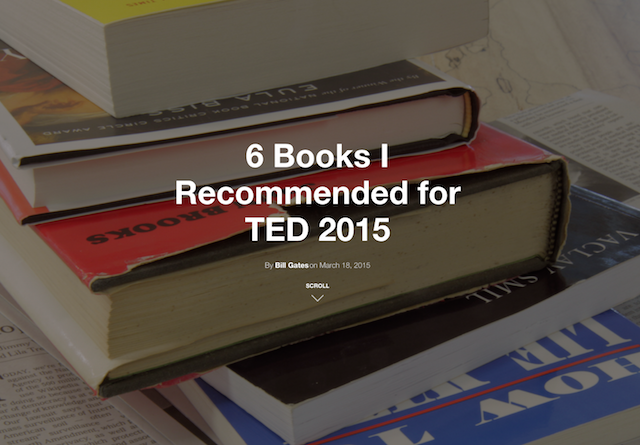 The organizers of TED asked Bill and Melinda Gates to suggest some books that attendees might enjoy. Bill picked 5 and Melinda picked five and their choices couldn’t be more different or interesting. Gates even picked one from his favourite living author. This isn’t the first time I’ve cherry picked book ideas from Gates. I ordered a few of his 7 best books of 2013 and 2012. The diversity of what he reads is mind-boggling. And, largely because of Gates, I’ve started reading Vaclav Smil. Steven Pinker’s carefully researched study stands out as one of the most important books I’ve ever read. Pinker paints a remarkable picture showing that the world has evolved over time to be a far less violent place than before. It offers a fresh perspective on how to achieve positive outcomes in the world. A thoroughly worthwhile read. I know from personal experience that stepping into the public square to announce that foreign aid is important and effective can be lonely work. Charles Kenny’s elegant book on the impact of aid carefully documents how the quality of life—even in the world’s poorest countries—has improved dramatically over the past several decades. With reams of solid data to support his case, he argues that governments and aid agencies have played an important role in this progress. Katherine Boo spent three years getting to know the people of Annawadi, a slum of about 3,000 people on the edge of a sewage-filled lake in India’s largest city. Her book is a poignant reminder of how much more work needs to be done to address the inequities in the world. But it’s also an uplifting story of people striving to make a life for themselves, sacrificing for their families, and in their own way, being innovative and entrepreneurial in creating a vibrant local economy. Norm Borlaug is one of my heroes—and Leon Hesser’s biography is a fascinating account of Borlaug’s life and accomplishments. This is a story of genius, self-sacrifice, and determination. Borlaug was a remarkable scientist and humanitarian whose work in agriculture is rightfully credited with saving the lives of over a billion people. Vaclav Smil is probably my favorite living author. If you care about energy issues, I recommend this volume, though its unvarnished look at the realities of energy use and infrastructure may be disconcerting to anyone who thinks solving our energy problems will be easy. Smil provides a rational framework for evaluating energy promises and important lessons to keep in mind if we’re to avert the looming climate crisis. Roger Thurow movingly chronicles the lives of four Kenyan farmers as they struggle to support their families through the wanjala, Swahili for “hunger season.” This book is both about the importance of investing in Africa’s smallholder farmers and a compelling blueprint for doing it effectively. Thurow shows how, together, we can make this wanjala the last one. This is the story of an extraordinary woman: Molly Melching. For more than 40 years, Molly has worked in Senegalese communities to help improve lives for some of the country’s poorest people. Her success is based on her insistence on working in close partnership with local communities. That way, change is always driven from the center out, not the top down. This book reinforced my own belief that developing communities already have the potential and desire to spark the change that will lead to better lives for themselves and their families. Paul Farmer is longtime friend of mine, and through these pages, you can hear his voice and feel his deep personal connection to improving lives for people who are too often ignored. You also get a sense of his (and Father Gutierrez’s) intellectual commitment to changing the systems that lead to poverty, so that their work has a permanent impact. Design thinking is a model of problem solving that could have huge implications for global health and development. It’s an approach that recognizes that the people facing challenges have the best understanding of what solutions will really work for them—so we need to invite them to participate in the design process as well. So many of the women and families I meet already have the potential to lift themselves out of poverty. Design thinking reminds us that to unlock this opportunity, we have to first enlist their help. In 2011, Leymah Gbowee became a global figure when she won a Nobel Prize for launching a grassroots women’s movement that led to peace in Liberia. This is an amazing tale of a group of women coming together to change the course of a country’s history—and it’s also the inspiring story of how Leymah overcame her own doubts and fears and found the courage to lead them.